The Syrian Democratic Forces' (SDF) plans for talks with the government come on the heels of the Helsinki summit meeting between Presidents Putin and Trump, where the two men focused extensively on the Syrian conflict and ways to resolve the country's ongoing humanitarian crisis. The political arm of the SDF, a Kurdish-dominated militia group which controls much of northern and eastern Syria, is working to create a negotiating team for possible talks with the Assad government, key Syrian Democratic Council figure Hekmat Habib has told AFP. "One of the meeting's aims is to create a platform to negotiate with the Syrian regime, "Habib said. "This platform will represent all areas in the autonomous administration and all areas held by the SDF," he added, without providing more details. Members of the Syrian Democratic Council, the SDF's political arm, met in the northern Syrian town of Tabqa on Monday for discussions on a number of issues, including the possibility of negotiations with Damascus. Formed in 2015 as a loose alliance against Daesh (ISIS)*, the SDF has received substantial assistance from the United States, France, and other Western powers in its fight against the terrorists in eastern Syria, and now controls substantial areas of the country, mostly east of the Euphrates River, including strategically and economically vital areas. 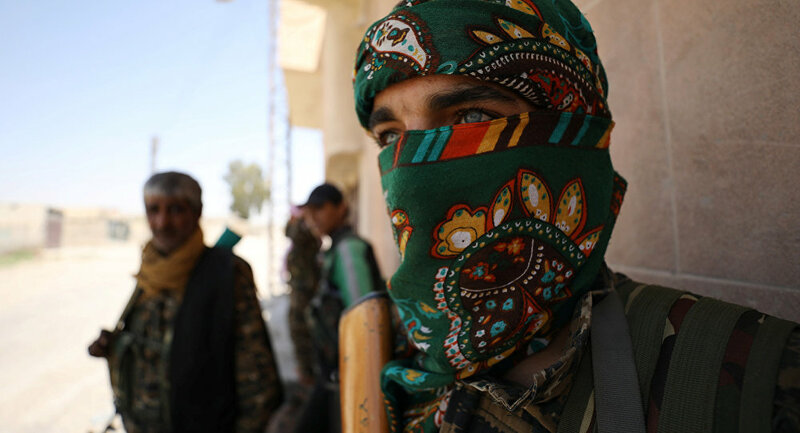 Washington's support for the SDF has led to frictions with its NATO ally Turkey, which considers the SDF's YPG (People's Protection Units) militias terrorists and has led a military operation against them in northwest Syria since early 2018. Damascus and the SDF have been discussing the idea of peace talks since May, with the SDF saying it was open to talks with the government, and the Assad government calling on the Kurds to negotiate amid pressure from residents in SDF-governed territories seeking the return of Damascus' governance. Syria was one of the major topics of discussion at Monday's Helsinki summit meeting between Presidents Putin and Trump, with Washington and Moscow agreeing on the need to restore peace and resolve Syria's humanitarian crisis. Preempting rumors of a possible US withdrawal from the country Monday, US National Security Adviser John Bolton said that US forces would stay "as long as the Iranian menace" remains in the region. Bolton's remarks fly in the face of President Trump's earlier remarks that the US would get out of Syria "very soon" to "let other people take care of it" now that the fight against Daesh is wrapping up. Damascus has repeatedly slammed Washington's ongoing military presence in Syria, calling it a violation of its sovereignty and pointing out that the US doesn't have a UN mandate for its operations. *A terrorist group outlawed in Russia and many other countries.